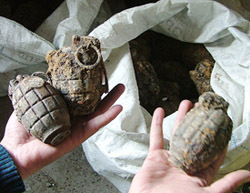 In a chance recovery, as many as 114 live grenades and three boxes containing explosives were recovered while digging the foundations of the new administrative block in the SGPC complex, here today. Are parents the most to blame for female foeticide? Viewers of Doordarshan across the country will not be able to watch the action of the much-awaited India-Pakistan Test series from Friday next live as Prasar Bharti in its proposal submitted to the Supreme Court today settled with the international channel Ten Sports for showing only 90-minute highlights of the cricket matches after the day’s play. In video: DD not to show India-Pakistan Test matches live. Succumbing to pressure from Left parties and UPA allies, the government today put on hold the decision to reduce the quantity of foodgrains under the public distribution system, amounting to a subsidy of Rs 4,500 crore, the Union Agriculture Minister, Mr Sharad Pawar, said here today. Lok Sabha Speaker Somnath Chatterjee has called for an all-party meeting here on January 20 to discuss the situation arising out of the Delhi High Court notice to the Rajya Sabha, Lok Sabha, Election Commission and the Centre on the expulsion of MPs in the cash-for-query case. President A.P.J. Abdul Kalam and Prime Minister Manmohan Singh today greeted the nation on the occasion of Eid-ul-Zuha, which will be celebrated tomorrow. “On the occasion of Eid-ul-Zuha, I extend my greetings and good wishes to all my people in India and abroad and to all those who have performed Haj-Baitullah this year,” the President said in his message. I am not executing the decision on food subsidy cut. The entire decision has been stayed. I will discuss this issue with UPA people. If the Communists had their way, then ‘luxury’ goods, cars, a number of other services and transactions in the stock market would attract the knock of the tax authorities to fund their pet social sector projects. The Indian Air Force (IAF) today said it did not have any objections to the screening of Bollywood megastar Aamir Khan's latest movie "Rang De Basanti". Broadening the dialogue process in Jammu and Kashmir, the has invited separatist leader Sajjad Lone of People’s Conference for talks with Prime Minister Manmohan Singh on January 14. 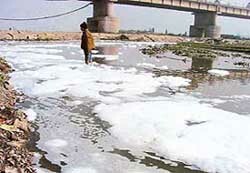 All main rivers of Punjab are highly contaminated with bacteria, posing a threat to humans. This is the finding of the Punjab Pollution Control Board. A view of the highly contaminated Ghaggar near Dera Bassi. Copyright : The Tribune Trust, 2005.